I didn't realize it had been so long since my last post until I had a nice email from one of my readers. Things are going ok here; I've just been busy. I also had to take a long day and clean up my sewing room after finishing my Rotherfield Greys quilt. I had really pulled out lots and lots of fabrics. I'm back to making six pointed stars again. I have had these stars cut out and glued to the papers for so long that I don't remember what most of the fabrics are. The bottom left star is Amelia by Jo Morton. I've been thinking a lot about setting ideas for these stars. This is one of my ideas. I like that it makes a hexagon! Here are a few more that I've done. When I sit at the machine to sew, I have been working on some little nine patches that will finish at 3 inches. Right now there is no plan for them. I have a lot of projects to work on. I just need to pick something and get busy. I hope you are all finding some time to stitch! My Rotherfield Grey quilt top is finally finished. I've been working on the applique' of the outside border for what seemed like ages. Those are English paper pieced 1" stars that are appliqued' onto the background squares. Here are a few photos of different parts of the quilt. This center was my first attempt at broderie perse. I love how the flowers look. Those center hexagons are 1/2". The braid was all appliqued' on by hand. 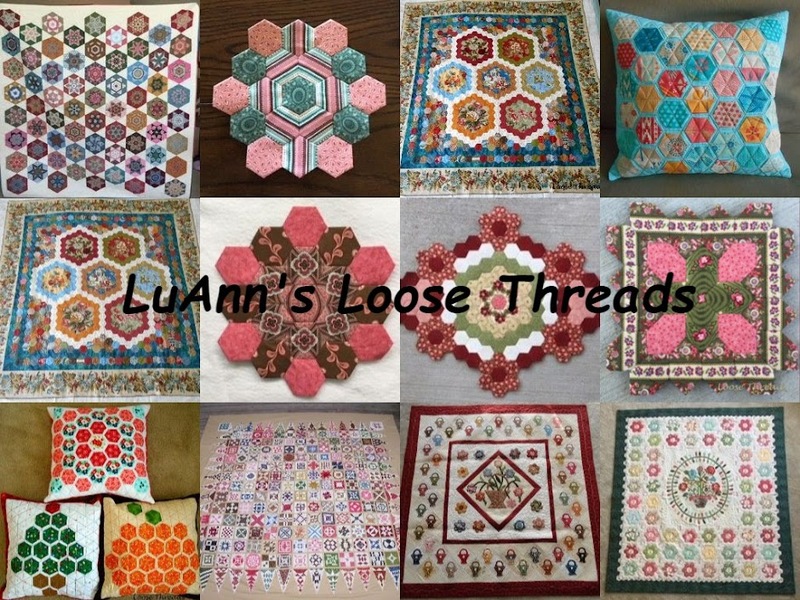 The hexagons in the border below are 5/8". I loved cutting up some of my stash to make the rectangular framed border. Each of the outside stars has 3 of the same brown points and 3 of various other colors. I fussy cut the brown star points so each would have a flower at the point. After I took the photo below, I tore the corners off and fixed them. All of the borders that have a star in the corner are facing the same direction. The corner stars in the outside border were twisted the wrong way. Probably no one besides me would have noticed that. This was the outside corner of the rectangular round. This top was a huge finish. I've been working on this one off and on for about a year.